New York in 1900 was a city of immigrants, the gateway for immigration from Europe. Newcomers tended to settle in neighborhoods where they could preserve some of the customs and traditions of their homelands. So there were neighborhoods that were primarily Polish and east European, others that were primarily Italian. 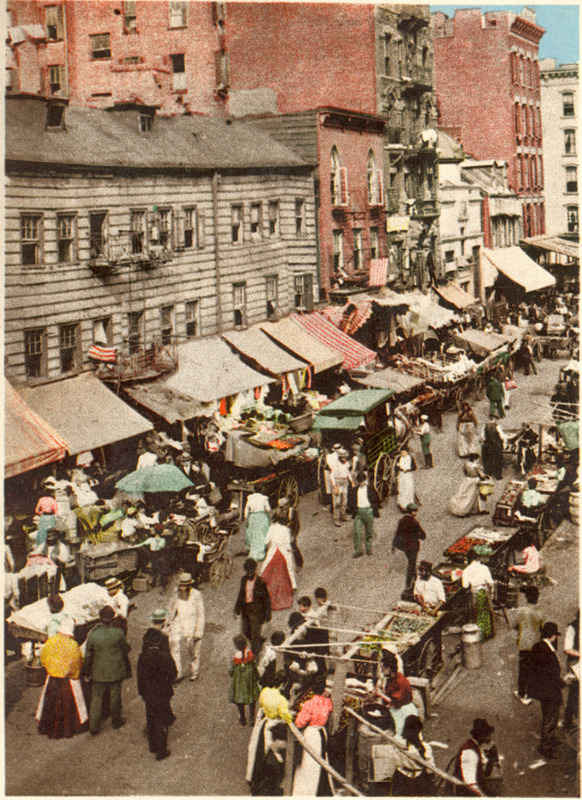 The lower east side was home to a predominantly Jewish population. Each of these cultures and nationalities contributed to the vibrant mosaic of New York City, but they also formed little cities within the great City. Journey back in time today on this market day and browse the stalls. Look at the clothes and groceries for sale in this open air market that goes all the way down the street. Hunt for bargains and try to get the best deal on the latest gadget for the home, or delicacy. Imagine the vibrant sounds, the laughter of happy people, and the haggling of merchants and customers. 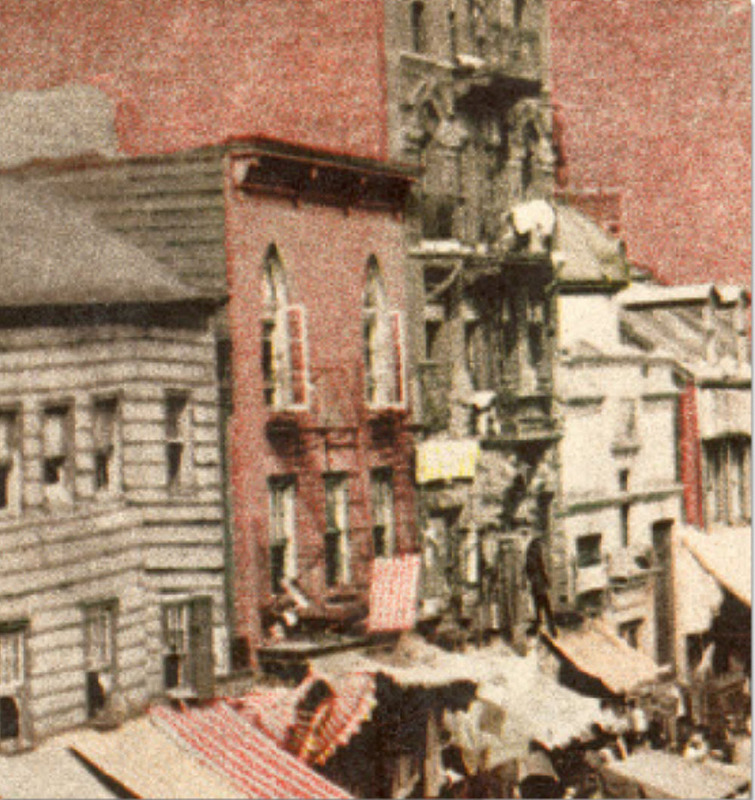 A closeup showing greater detail of the street scene. 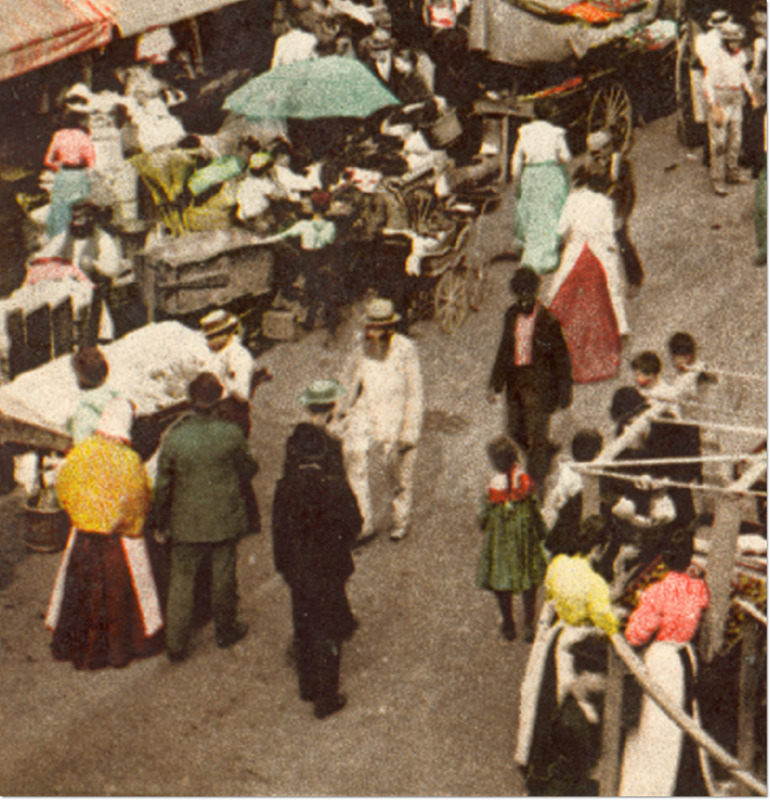 We can make out the kids scampering around the stalls, the women in pretty dresses shopping for deals, and the well dressed men, all captured in a moment in time this beautiful day in 1900 New York. Now look at the buildings on each side of the street. Some are finely constructed, while others seem run down. The housing conditions for new immigrants, in crowded, expensive New York were not always ideal. View of the apartment buildings along the street. Colorful awnings and drapes can be seen. So now it is time to end our tour of 1900 New York and this lovely market. I hope that you found what you were looking for. 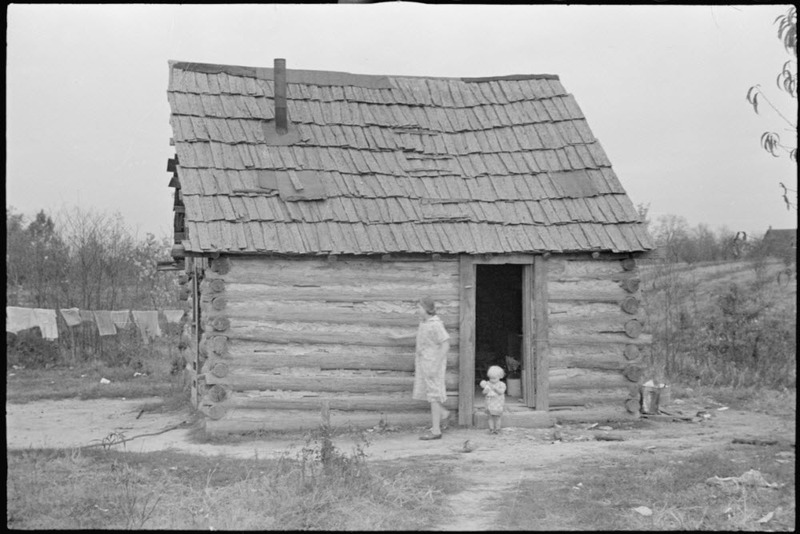 This photograph shows what it meant to be poor in rural America during the Great Depression. This house, little better with a shack, with sagging roof and shoddy construction was home to a family of ten in 1935. In this moment frozen in time, we can see the cramped little house, and imagine the leaky roof, the dirt floor, and cold drafts coming whistling through the log walls. Zooming in closer, we can pick up some interesting details about the life of this poor American family. 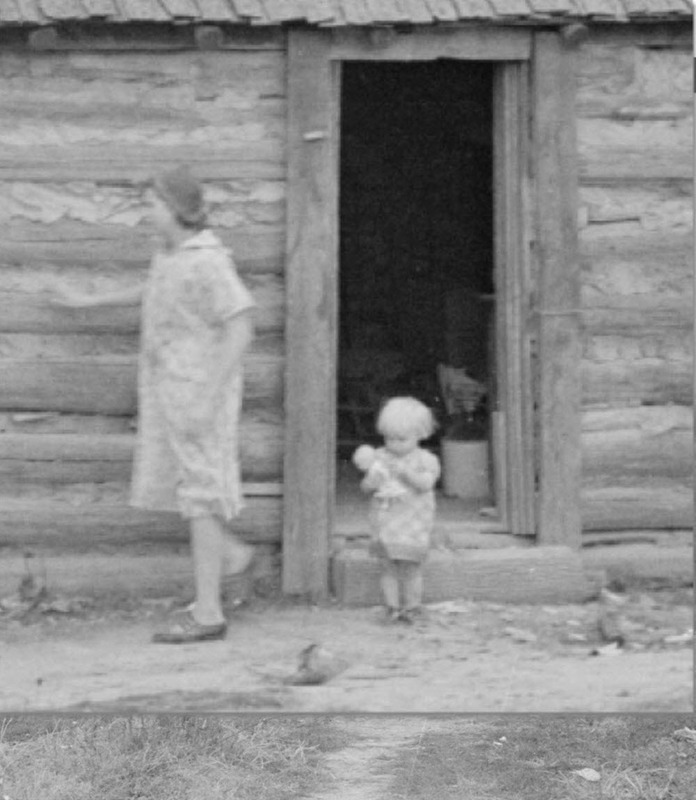 Below is a closeup of the area of the photograph around the door, showing the woman and her daughter in better detail. The woman, presumably the mother, is wearing a light dress with a faint patter, as well as a cap. She is very young to have already given birth to 8 children. We can assume that all she has known is a life of want and hard work. She is walking along the side of the house, perhaps going to the laundry which is hanging from a line out front. Behind her is her little daughter. She is holding her dollie, probably the only toy that she owns. And behind her stands an open door. We can see the faint outline of some wooden furniture, perhaps a chair. And there is a large jug by the door. What does it hold? Water? Moonshine? The house is roughly built, and the roof is in bad shape. 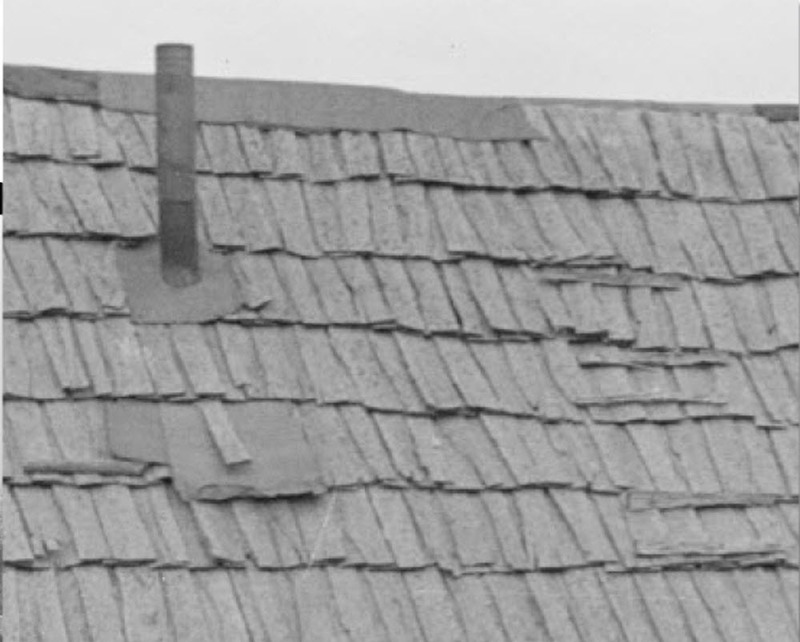 If we zoom in on the roof we can see that it has been patched with uneven home made shingles. And there is a single chimney stack which will be connected to a wood stove, where this woman will make all the meals for her large family – when there is enough to eat. 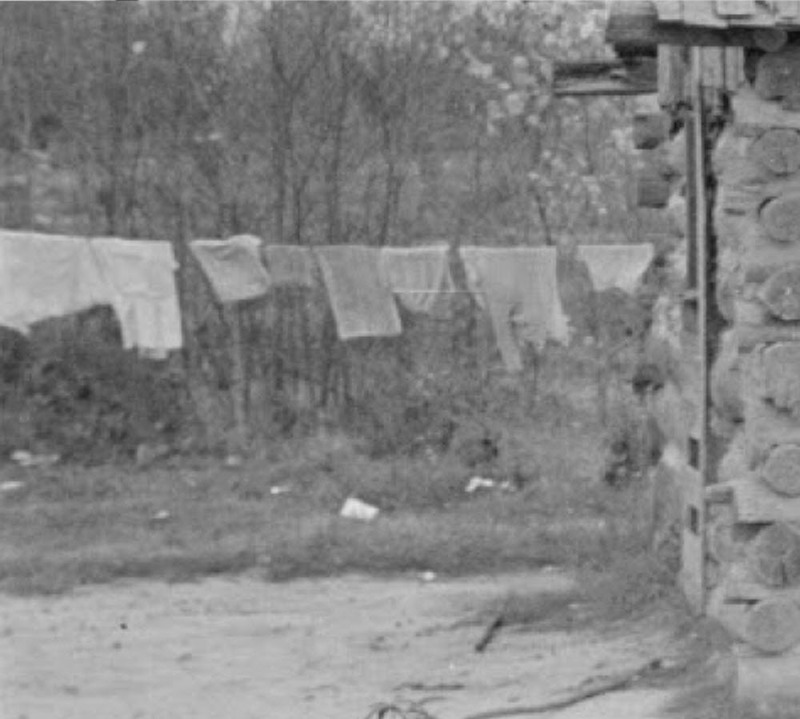 And here is a picture showing a closeup of the clothesline. The wife would likely have been responsible for washing all of the laundry by hand and then setting it out to dry. Imagine keeping up with washing the cloth diapers of a huge brood of kids – no disposable diapers back then – with no running water and just a wash tub or basin. Their meager belongings are drying in the wind, flapping over a bleak lawn strewn with assorted papers and junk, the jetsam of Great Depression poverty. We can look back and feel glad that our society has moved forward and most people in North America – though certainly not all – enjoy a better standard of living. And yet I cannot help but think that even though our lives have gotten richer in a material sense, we have lost something. This family, though poor, was self reliant. The husband and wife both worked, and the older children all helped with the younger ones. They struggled but at least what they had was earned by them.